This is my 4th year participating in the A-Z Challenge. I am writing about people who were born into slavery and lived to be free and their descendants. They are not my ancestors. Otis Graham was born in Elmore County in 1869, to John and Anna Graham. She grew up surrounded by family. Her grandparents lived next door and her uncles lived nearby. All of them were farmers. The family was recently out of slavery, which ended in 1865, and they were unable to read and write. Otis lived with her uncle Henderson after her father died. She attended school through the 2nd grade. 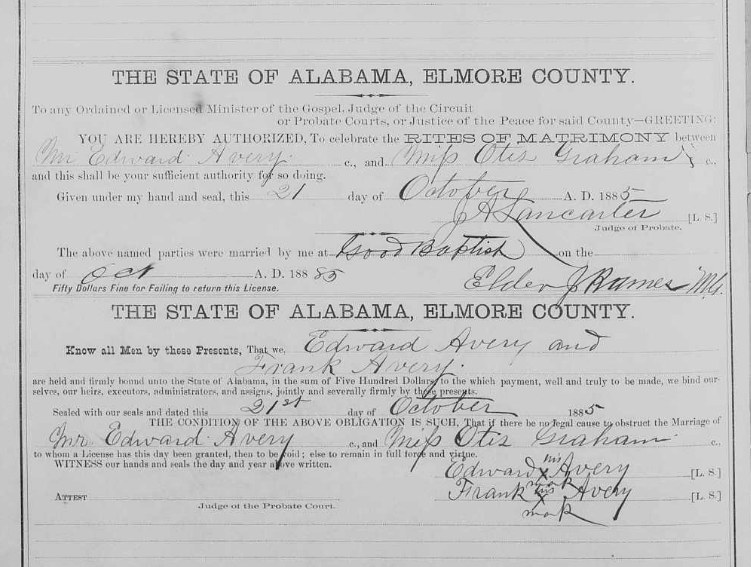 Otis married Edward Avery on October 21, 1885 at The Good Baptist Church in Elmore County by Elder Rames. Edward’s father, Frank Avery was a witness. By 1900 Edward owned his farm, with a mortgage. He was 33 and could read, but not write. Otis, at 32, had given birth to seven children and all were still alive and living at home. The two oldest, 13 year old Willie and 11 year old Daisy attended school. I do not know what happened during the next twenty years because I could not find them in the 1910 census. In 1920, the family was living and farming on rented land in Liberty, Autauga County. Otis was 50 and Edward was 54. There were four children at home. All of them had been born after 1900. That makes at least 11 children in the family. Mary was fifteen and the oldest child at home. She and thirteen year old Gertrude were both literate. Eleven year old Boss and eight year old Graham were not. No one had attended school in 1919. Edward died before 1930. 65 year old Otis and her youngest son, Graham were back in Elmore County. They lived in a rented house. Graham supported them doing general labor. Otis was not employed. In the 1940 census we learn that 23 year old Graham Avery completed 6th grade. He was doing farm labor. 75 year old Otis was a laundress working from home. She had completed 2nd grade. They were in the same area living in a rented house. I found a death record for an 88 year old Otis Avery in Mobile Alabama for 1959. It does not include parents or husbands name because it is just an index entry and not the death certificate, so I am not positive it is for her. Most of the children remained in Elmore county. One daughter and her family moved to Pittsburgh, PA. Graham ended up in Birmingham, AL. It’s hard to imagine what people’s lives were like back then. I cannot imagine being 77 and still working as a laundress. They were hearty people!!! And probably very, very tired. A hard life, but it sounds like they found a way to earn a living and keep a roof over there head. Not an easy task. The lack of education must have made it much harder. I think that in those times what really made it difficult was not owning your own land and having what you needed to farm, if you were trying to farm. And not having a skill- like carpentry, plastere, seamstress – something that you could do that would make money if you were in the city. Farming for shares was a losing proposition and only being able to sell your labor was tough. I am amazed at the amount of research you’ve done–and so glad you have, otherwise how else would we learn about these amazing people? Age 32 with 7 kids already – makes me tired just reading it! I guess people did what they had to do because they didn’t know any different. Learning Otis was a woman threw me momentarily because this name was given to several men that I know. But there was a character named “Miss Otis” in “Fried Green Tomatoes,” so I should not have been so surprised. I think they did what they had to do because that’s what they had to do. They could look around and see that not everyone had to do it that way. My husband said the same thing about the name Otis. He proofs my posts for me because I can’t always see the obvious mistakes. I have a girl Otis in my extended family of ancestors. I never read “Fried Green Tomatoes” although I have heard about it. I think I’ve learned more about general history since I started doing family and community history than I did when I was in school. It was so boring to me in school. We never studied the impact the big events had on regular people. Great post & research! Well done ? It wasn’t just having been slaves. A surprising number of people and families emerged strong and intact. There was the having to start out without anything when you walked away from the plantation. There were the lynchings, the lack of full schools for many, the discrimination in jobs and housing, the lack of the vote, the violence, all the things after slavery that were designed to keep black people “in their place” and on the bottom. The amazing thing is that so many people survived and so many families survived so strong. Community and social history can provide so many insights into what life was like in various settings and locales. I’m learning a lot from the stories of the people you selected to focus on for this A-Z Challenge.